Kamchatka (Kamchatka Krai) occupies the space of 472,3 thousand sq.km (2,8 % of the territory of Russia), including a part of the continent, the peninsula of Kamchatka, Karaginsky and the Commander Islands. The extreme southern point settles down at width about 51 degrees, (approximate width of Dresden and Kiev), a northern point about 65 degrees of a northern latitude (Arkhangelsk). Extent from the North to the south about 1600 km, from the West to the east, in the narrowest part about 80 km, in the widest of about 450 km. The peninsula of Kamchatka — the most unique mountain area in Russia. It is a part of «The Pacific fiery ring». Beringova of the seas and the Pacific Ocean is washed by cold waters Okhotsky. On an axis, in the meridionalny direction, the extended Central Range (about 900 km) divides Kamchatka into the western and east parts. 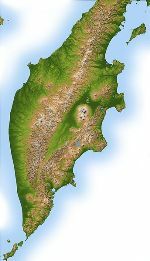 The western part — the boggy lowland with the equal coastline, cut up in hundred the rivers flowing from slopes of the Central Range to the Sea of Okhotsk. East part — a valley of the river of Kamchatka flowing to the north between Median and East ridges. The main coastline of East coast along which passes a deep-water trench, is abrupt, a skalist, is cut up by bays and peninsulas. Kamchatka — a zone of a modern volcanism: 30 operating, about 300 gone-out and destroyed volcanoes, more than 2500 volcanic cones. Set of hot and cold springs and geysers. One of the most attractive places — East volcanic uplands with the largest volcanoes of Eurasia. The highest point (4850 m above sea level) — top of the Klyuchevsky volcano. The lowest point (316 m below sea-level) — a bottom of the Kuril lake. Climate generally damp, cool. Abnormally colder and windy on low-lying coasts (especially on western), than in the center, in a valley of the river of Kamchatka which has been fenced off by ridges from dominating winds. The first snow, usually, lays down at the beginning of November, and the last thaws only in July. Mountain tops become covered by new snow in August-September. In all coastal territory winter warm, soft, multisnow, in a continental part and in mountains — cold, frosty with long, dark nights, in very short afternoon. Calendar spring (March-April) — this best time for skiing: snow dense, weather solar, day long. The actual spring (May, June) — short, fast. The vegetation promptly grasps the territories released from snow and covers all free space. The summer, in the standard concept, on Kamchatka happens only in a continental part of the peninsula. From June to August generally cold crude cloudy weather with rains, fogs and low dense overcast. Autumn (September, October), as a rule, slightly overcast, dry, warm. Sometimes more warmly than summer.